North Way is a vibrant and growing multi-campus church located outside of Pittsburgh, PA. They came to us with a dream to create an atmosphere with such a high level of quality and intentionality that it enhances their community's connection with the Lord. Through extensive collaboration, we developed a multi-phase plan that would focus on their main campus in Wexford, PA. This overhaul would enable every attendee, both locally and at their regional campuses, to better connect with the teacher through distraction-free broadcast video. The church’s dream for this project was that technology would create an atmosphere to draw people into the presence of God - an atmosphere that enhances their community’s connection with the Lord. In order to fulfill the vision, a full production overhaul would be completed over three phases. This required very intentional planning that would keep long term elements in mind as we rolled out the beginning phases. This broadcast video system would be mission critical every week, serving as the origination site for video to their five other campuses. As such, we developed a system with high priority on tried and true, flexible work flow that would be friendly to the volunteer-driven crew. A new control room space was developed along with new infrastructure to allow for multiple camera locations and implementations. The phase one lighting system was installed in one week in order to minimize impact to the church’s ministry schedule. In order to streamline our time on site, we fully built-out and tested the system at Mankin HQ in Franklin, Tennessee, which included pre-cabling trusses and pre-programming fixtures. The video system was installed over the course of four weeks with a temporary system in place utilizing old gear as a stopgap. North Way has a very small production staff whose primary responsibility is to raise up and disciple volunteer teams, not feed and water technical systems. Through the Guardian by Mankin’s LifeLine & Protect services, we’re able to provide production support both during weekend services and throughout the week, ensuring the message capture and live service experience are the best they consistently can be. The theatrical lighting system is anchored by a number of Chauvet Rogue and Colorado fixtures, a Jands Vista lighting console, CreateLED AirBLADE low-resolution LED panels, and MDG atmosphere. From a creative standpoint, there was high value placed on developing a “tool box” that could be utilized to create variety over time with the same building blocks. This led to a strategic marriage between theatrical lighting with great haze, and low-resolution, abstract, blow through LED video product, which provided tremendous value and maximum flexibility of scenic layers. The broadcast video system is one of the first house of worship installations of Panasonic’s UC3000 4K-capable high definition broadcast cameras, alongside a For-A video switcher, AJA routing, Cobalt and Tektronix terminal gear, scope, and master clock, a number of ProPresenter GFX Workstations, and Middle Atlantic control room furniture, equipment racks, and power conditioning. 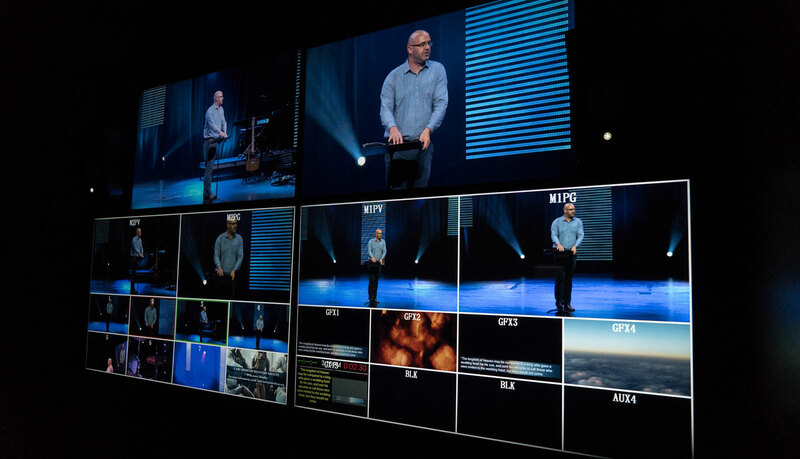 One specific example of the innovative use of technology is the utilization of AJA Ki Pro Ultra video recorders/players being fed four independent signals for capture – the IMAG cut, a clean IMAG cut without message support, the locked off center shot of the teaching pastor, and a GFX source – with the ability for regional campuses to choose two of these sources to playback depending on their unique needs; all from a single capture/playback device. This project provides tremendous value from top to bottom, both in resources and in flexibility. We are especially proud of how the marriage of theatrical lighting and blow-through low-resolution LED video is executed in the lighting system design. This is an emerging visual trend in houses of worship that we are glad to borrow from the concert touring world and lead the way in this industry. Thus far, these new tools have been game changers for the North Way community. The lighting and video systems have been well received by this multi-generational church exactly as they hoped – creating an intentional, enveloping experience for people to engage with God.